Every year, more than 100 species of migratory birds pass through New York City on their way between South and Central America and their northern breeding grounds along the Atlantic Flyway. The trek through the City can be perilous for these birds because of the maze of tall buildings, bright lights, and reflective glass. 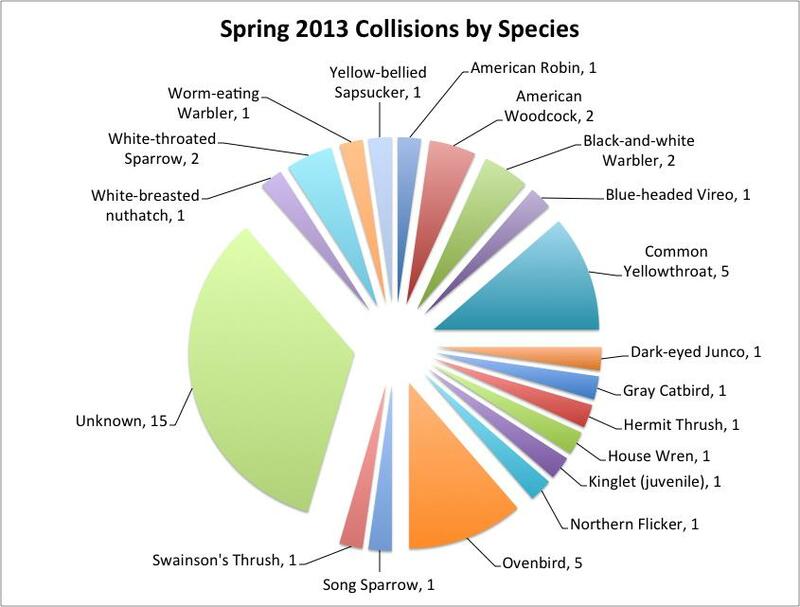 Since 1997, NYC Audubon has sponsored Project Safe Flight (PSF), an endeavor to study and mitigate urban bird collisions. Working with a devoted group of volunteers who patrol high-risk locations during migrations, Project Safe Flight counts and collects birds that have been injured or died in building collisions. To date, over 6,000 birds of 126 different species have been found and documented in PSF’s database. This spring, eight sites were monitored, and a total of 39 dead and five injured birds were found by volunteers. Of those, 29 were identified to the species. 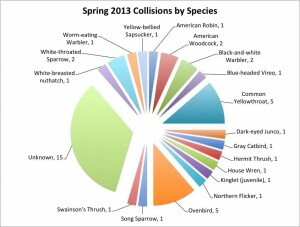 Just like previous years, common yellowthroats and ovenbirds were found more frequently than any other species; they were followed by white-throated sparrows, American woodcocks, and black-and-white warblers. The majority of collisions occurred at Bryant Park and the Metropolitan Museum of Art. We will include this year’s data with our records from 1997–2012 and analyze it to help us better understand why bird collisions occur, and what can be done to reduce their frequency. Soon, volunteers will be gearing up for the fall migration. If you’re interested in volunteering for this important project please contact our outreach manager at apalmer@nycaudubon.org. On July 23, NYC Audubon staff and interns went out to Plumb Beach in Brooklyn to help horseshoe crab researcher Mark Botton search for baby crabs. Though we couldn’t help but stop to look at the birds—we saw several oystercatchers, plenty of gulls and terns, and a flock of juvenile barn swallows—the tiny, newly hatched horseshoe crabs stole the show. 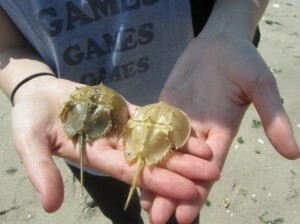 Though the horseshoe crab hatchlings we were looking for were in the same shape as the adult crabs we count and tag during the spawning season, they were considerably more difficult to find. Smaller than a ladybug and the same color as the sand, the crab larvae were practically invisible in the shallow waters of the low tide. Fortunately, we were able to find a few of the baby crabs, which were promptly measured and released. During our search, we also stumbled upon the molted shells of several older horseshoe crabs that likely hatched two or three years ago. 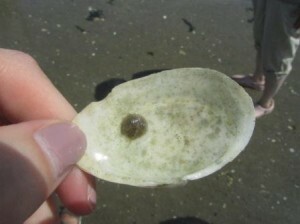 the density of eggs at different depths of sand at several points along the shoreline. Using five-cm and 20-cm cores, the group collected a total of 120 samples of sand to analyze back at the lab. This data can be used to determine where crabs are laying their eggs on the beach, among other things. For example, since birds can only reach eggs close to the surface of the sand, looking at the egg densities in the five-cm core sample can help clarify just how much of this important food resource is available for shorebirds on Plumb Beach.